Android 2.3 Gingerbread brings not only improved performance and battery life, but also boosts system security and gives a slight refresh to the UI of Google's platform and that's why it's a must-have update. 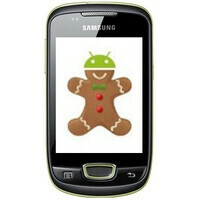 And if you thought its just the big guns getting it – you might want to rethink as SamFirmware has gotten their hands on the first build of Gingerbread for some of the most affordable Android handsets by Samsung. The Samsung Galaxy mini and Galaxy Gio are both getting Gingerbread in its 2.3.3 flavor, but if you can't wait for the official OTA to hit your handset, feel free to head to the source link below to get an image of the beta firmware and detailed instructions. After downloading the XXKPF update for the Galaxy mini and the XXKPA update for the Galaxy Gio, you can flash it and enjoy all the benefits of Gingerbread. With their humble specs, the two handset also prove an important point – hardware seems to be hardly a restriction for the update. A good argument to have in mind if you don't get your high-end Android updated, isn't it? okay sammy how about the USA Galaxy S devices???? problem is carriers get paid to put those apps on the phones. they arent going to stop unless someone forces them.